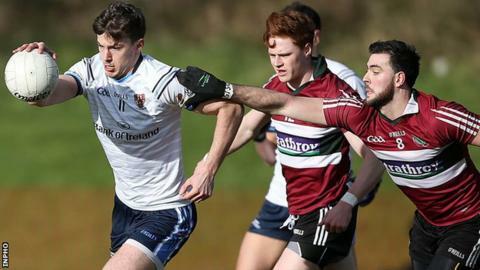 Paddy McBrearty kicked five points to help Jordanstown to a 0-14 to 1-6 win over local rivals St Mary's Belfast in Wednesday's Sigerson Cup quarter-final. UUJ, who are tournament hosts, led from start to finish and were 0-7 to 0-2 ahead at the break. Down's Jerome Johnston made a big impact for St Mary's as a half-time substitute and scored 1-2 from play. They closed the gap to two with a Kevin McKernan score but UUJ finished strongly to earn a semi-final spot. Jordanstown had the wind advantage in the first half and made an electric start, scoring four unanswered points inside the opening seven minutes. Ethan Rafferty, who hobbled off mid-way through the half, nailed a '45' with Donegal forward McBrearty hitting two frees before fit-again Monaghan star Kieran Hughes scored the first point of the game from play. Tyrone forward Ronan O'Neill hit two first-half frees, but UUJ were well in control with Frank Burns' long-range point followed by an excellent score from the wing for Ritchie Donnelly. Burns slotted over again at the start of the second half to stretch Jordanstown's lead out to six points, before Johnston hit 1-1 in quick reply. He scored St Mary's first point from play in the 36th minute and then landed the game's only goal nine minutes later, running with the ball from deep and jinking inside to blast the ball high into the roof of the net. McKernan's point reduced the deficit to 0-9 to 1-4 after 46 minutes but Monaghan's Ryan McAnespie scored straight from the kick-out to steady the home side. Conan Grugan got the end of a well-worked UUJ move to fire over from close range and McBrearty scored a superb point, his only one from play, catching a high ball and turning smartly before blasting over to grab a point from 40m into the wind. With time running out, McKernan forced a great save from UUJ keeper Sean Fox, who dived low to his right to beat away his goal-bound effort. St Mary's had seven second-half wides as UUJ progressed.